Kuroshio has brought numerous benefits to this town since long ago. The katsuo (bonito) coming in on the Kuroshio Current are at the center of food and culture in this town. The katsuo fishery in Kuroshio Town boasts a history of over 400 years, and the katsuo pole-and-line fishing votive pictures (1865) in the town show katsuo fishing at the time of oar-powered ships. Tosa’s pole-and-line fishing method, the method of catching katsuo with a single rod, is still handed down generation to generation. In the Saga area of Kuroshio Town there is a landing that boasts the top katsuo pole-and-line fishing fleet in Japan. 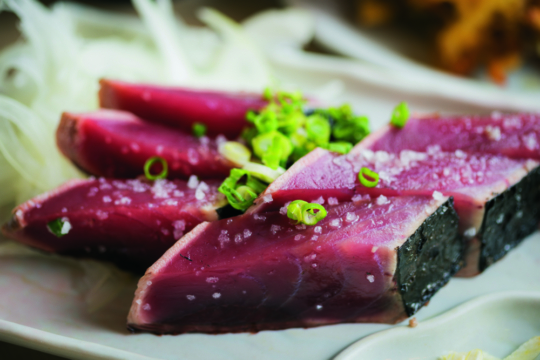 The katsuo caught that day is branded as “Tosa Saga Katsuo“, locally known as “birigatsuo,” and boasts a special flavor. Wonderfully chewy and rich, you can experience a completely different taste and texture from any other katsuo. 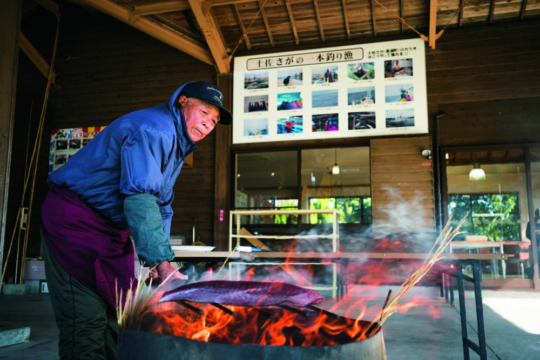 Let’s try making straw-grilled katsuo in the no.1 Katsuo pole-and-line fishing town in Japan! You’ll grill one whole fish over a strong-burning straw fire. After that we’ll eat salted katsuo no tataki using local sun-dried salt, just like the fishermen do. Next, we’ll try Kuroshio Ichibanchi’s special katsuo sauce. Finally, we’ll put the katsuo on top of the rice and stir it together with hot water. From the cleaning of the fish and along the way to its arrangement and seasoning, we’ll listen to the fishing tales of the town’s aunties and uncles.